A scene from one of AMSEA's recent water safety training workshop. Unalaska's fire chief and a local marine biologist will be among the instructors for an upcoming free safety workshop aimed at commercial fishermen. The Alaska Marine Safety Education Association (AMSEA) is offering the Drill Conductor workshop. It's being held at Unalaska's Public Safety Department on a Friday and Saturday, Jan. 8 and 9, 2016. According to organizers, instructors Melissa Good, Zac Schasteen, and Tim Mahoney will cover all aspects of cold-water survival skills, such as "EPIRBs, flares, and maydays; man-overboard recovery and firefighting; immersion suits and PFDs; emergency drills, helicopter rescue, life rafts, and abandon ship procedures." Workshop participants can expect an in-the-water practice session. 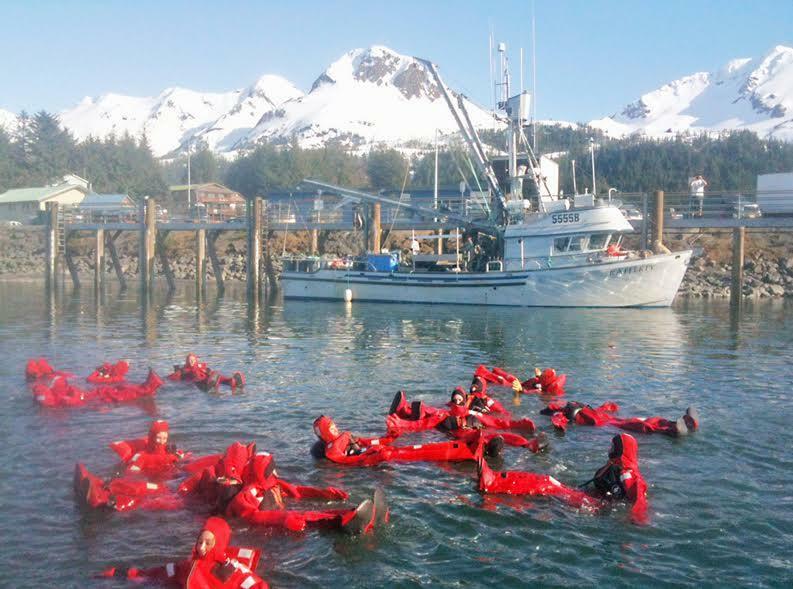 Because the workshop is supported by the U.S. Coast Guard, the Alaska Department of Commerce, Community, and Economic Development and the National Institute of Occupational Safety and Health, it is being offered at no cost to commercial fishermen. The ten-hour course satisfies the requirements for drill conductor training on documented commercial fishing vessels operating three or more miles offshore, organizers said. For non-commercial fishermen interested in taking the course, the cost is $175. The workshop meets from 8 a.m. to 1 p.m. both days. Find more information at www.amsea.org.